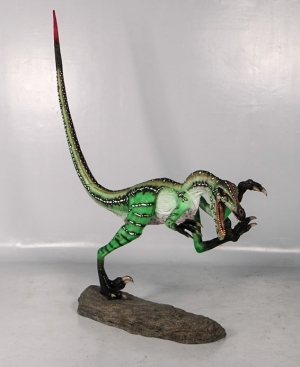 This is one of the most dynamic of our Dinosaur replicas; our resin Ferocious Velociraptor model is spectacular and looks wonderful in any Dinosaur or prehistoric set. This stunning Velociraptor model is approx 7ft tall at the tip of the tail. The dinosaur is represented in an attack pose with gapping jaws and talons; it looks amazing in foliage etc. The skin of this giant reptile is really well detailed. The tail section of this model is removable to ease movement and storage.